Year-on-year, prices in June 2018 increased by 10.6% from June 2017. In individual sectors, CCR, RCR, and OCR recorded a year-on-year price increase of 10.9%, 11.6%, and 9.4% respectively. June 2018 prices were up by 1.5% from the previous peak in April 2018. The price change was revised from 1.2% to 1.3% in May 2018. Overall and CCR prices continue to increase in June 2018. Quarter-on-quarter, prices have increased by 3.8% from Q1 2018. The quarter-on-quarter calculation is based on the index average of three months in the Second Quarter of 2018 and that of the preceding quarter. 2. Resale volume decreases by 25.5%. According to Non-Landed Private Residential Resale data compiled by SRX Property, an estimated 1,128 Non-landed Private Residential resale units were resold in June 2018. This is a 25.5% decrease compared to 1,514 units resold in May 2018. Resale volume was down by 45.0 % compared to its peak of 2,050 units resold in April 2010. 3. Overall median Transaction Over X-Value (TOX) is POSITIVE $17,000 in June 2018. The median T-O-X for Non-Landed Private Residential measures whether people are overpaying or underpaying the SRX Property X-Value estimated market value. The median T-O-X for June 2018 is POSITIVE $17,000. It is a decrease of $1,000 comparing to POSITIVE $18,000 T-O-X for May 2018. 4. District 21 posts highest median T-O-X. 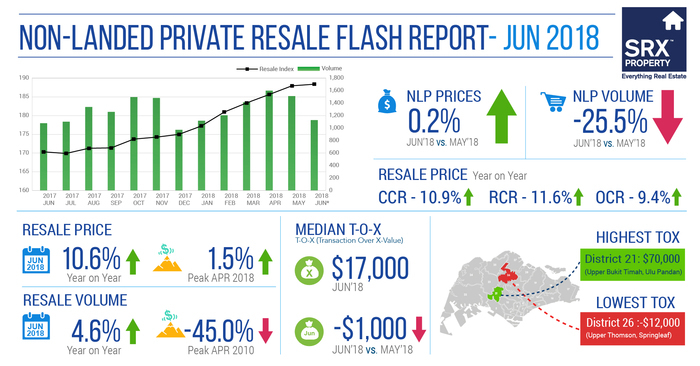 For districts with more than 10 resale transactions in June 2018, District 21 (Upper Bukit Timah, Ulu Pandan) posted the highest median T-O-X at POSITIVE $70,000. This suggests that a majority of the buyers in that district purchased units above the computer-generated market value. 5. Among relatively active districts, District 26 posts the most negative median T-O-X. District 26 (Upper Thomson, Springleaf) posted a T-O-X of NEGATIVE $12,000. This suggests that a majority of the buyers in that district purchased units below the computer-generated market value.